Today, Ganondorf is as well-known as an all-star video game villain as Bowser or Dr. Wily. But exactly how did the character grow into the figure of power and evil we’ve all come to know? Well, YouTube’s Really Freakin’ Clever outlines exactly how Ocarina of Time introduced and revealed its antagonist throughout the game, and explores how he is developed from a one-dimensional pig monster to a fully realized great king of evil. The video makes some really interesting points about Ganondorf’s role as a villain. For example given his introduction, most gamers in 1998 didn’t even initially realize he was related to the Ganon of previous games. His presence is continually felt throughout the story, his power is revealed slowly but effectively, and his role as the final boss feels suitably epic. These are cues we may not even realize are affecting us. What I found most interesting from the video’s analysis was that gamers are constantly given little tastes of Ganondorf’s power, but never enough to see the whole picture. These constant reminders create expectations for the final confrontation, and make the climax especially satisfying. This is a technique we can see at play in other titles, like with Skull Kid in Majora’s Mask and Zant in Twilight Princess. 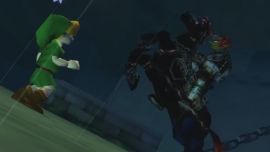 And perhaps the lack of such constant glimpses at an antagonist’s power is what made the fight with Demise in Skyward Sword not as exciting. Either way, go check out the video and see the small touches that made Ocarina of Time great.